Quick and easy drum programming—for anything. Drum Sequencer is a Player Rack Extension that can be added to any instrument device or plugin in Reason. With its set of powerful-yet-intuitive programming tools you’ll be knocking out drum beats faster than ever. With features such as repeats, probability and per-channel time resolution, the creative potential is endless! And the best of all - it adds fun to drum programming. Loads of fun! The ability to set individual speed and step count for each channel means you can go for polyrhythmic mayhem or simply create patterns that don’t sound repetitive after one play through. Unless that’s what you are after of course. Use Drum Sequencer the way that suits your creative flow best: to sequence all the drums for your project or as a blazingly fast starting point. 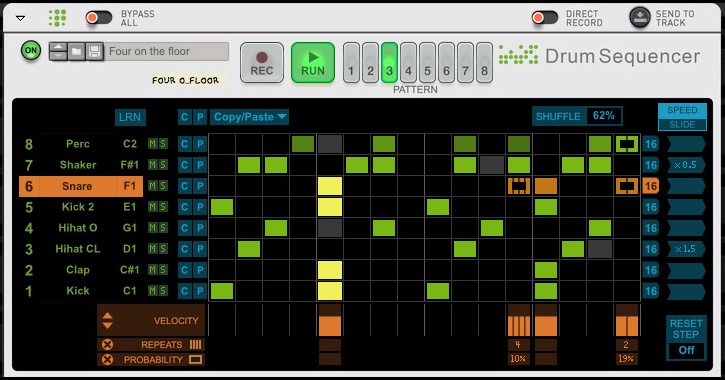 If you wish you can dump your patterns to Reason’s main sequencer so you can finish your work there. Apart from the visual interface, you can also record your drum takes in real time. Puts the computer-assisted drum programming environment in execution mode. Commonly referred to as ‘Play’. Create up to eight patterns per player. Pattern playback can of course be automated from Reason’s sequencer. Each channel is mapped to a key or pad on your Reason instrument. Use the LRN control to quickly map to the sounds you need. Each channel also has Mute & Solo functions. Set velocity, repeats (2-8, triplets or flam) and probability for each step in the selected channel. Here you can switch between setting speed per channel (x 0.25 to x 4) or setting the Slide, or playback timing offset (+/-120 ticks). You can also select the channel playback direction (forward, backward, pendulum or random). If you have different speeds on your channels, the Reset Step setting lets you restart the pattern after a selected step count. This menu lets you select edit options like clear, Alter, Random, Shift, Copy/Paste or Preset. You can apply the edit functions to the entire pattern or to each channel individually. Select the amount of shuffle to give your tracks just the swing you want.